Arthaud Yachting is your trusted partner for your product launch operations and your press trips. Last spring, we created a tailor-made solution for our client on-board a maxi-catamaran in St Tropez, an operation shaped together from A to Z by your nautical partner. Begin your work day at the terrace of the infamous café Sénéquier right on the harbour of St Tropez, with the sun shining, this pleasant invitation was sent out to twenty lucky journalists whom were asked to be present for the launching of the new collection of a French watchmaker! A beautiful day in May, saw these guests embark on one of our luxurious catamarans which was completely customized at the image of the client; personalised flags, videos projected onto the boat’s TV screen, the background music and set up was all thought out to showcase the brand of our client. 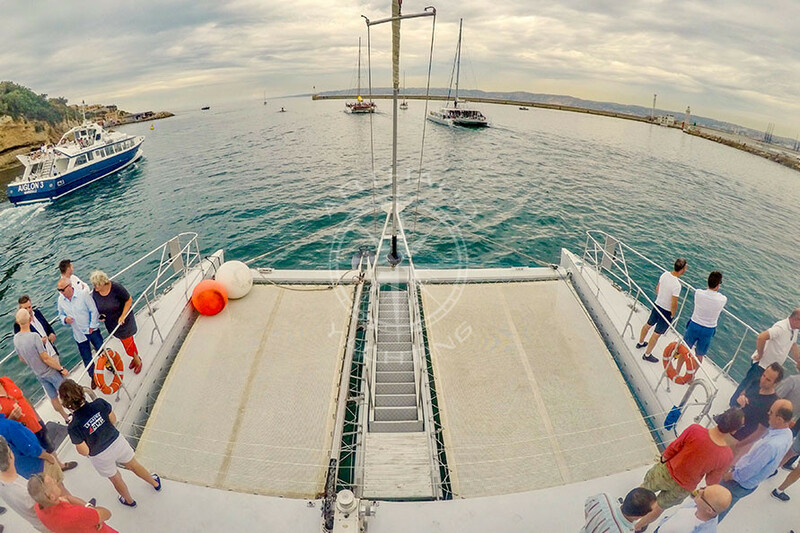 Our passengers were all very surprised to witness the latest creation of the French brand emerge from the sea with a group of professional divers before regaining the catamaran. A glass of champagne and a little cocktail was prepared to furthermore enhance their experience and discovery of the life in St Tropez as they slowly cruised along the beach from Pampelone to Ramatuelle before stopping for lunch in the renowned beach club Club 55. 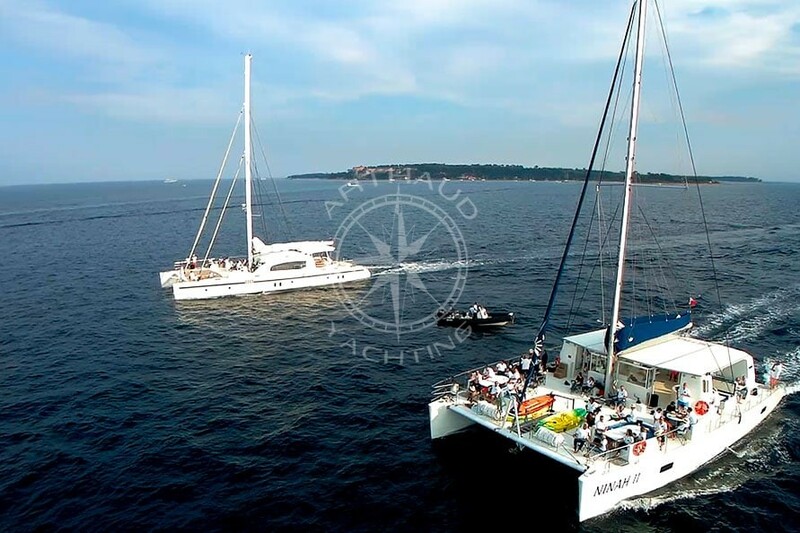 Nice and spacious covered areas, comfortable and relaxing exterior zones, a refined service, you too can opt for an atypical marketing event with a maxi-catamaran cruise in St Tropez. 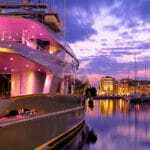 A professional crew will be at your service and at the disposal of your eighty guests whilst at sea in order to tend to their every need during a relaxing sailing cruise, a perfect moment for people to get to know each other. Their impressive characteristics will allow you to imagine the best way to utilise and set up the many square meters at your disposal: product launch, press trips, lunch or dinners at sea, birthdays, professional conferences, weddings, etc…Trust Arthaud Yachting to propose to you the most adapted maxi catamaran and guarantee you a successful event from planning it to executing it. 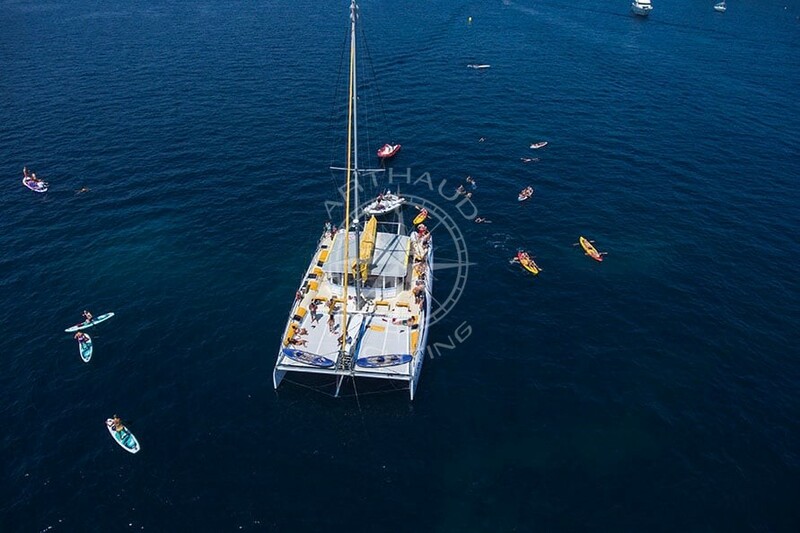 Between fifteen and forty meters long, the maxi catamaran is an ideal solution for both your private and professional events in Saint Tropez. 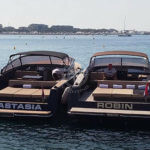 Just like the watchmaker Audemars Piguet, choose a maxi catamaran cruise in St Tropez in order to create and propose a memorable product launching event which guests will with no doubt enjoy sharing on social media. Overall a day filled with new discoveries for the journalists whom travelled from all over the world for this experience, and whom were able to discover the beautiful city whilst at sea, immortalise the picture perfect Citadelle of Saint Tropez, all whilst day dreaming about crossing paths with the iconic Brigitte Bardot and while contemplating our clients’ newest collection. Feel like sailing large? 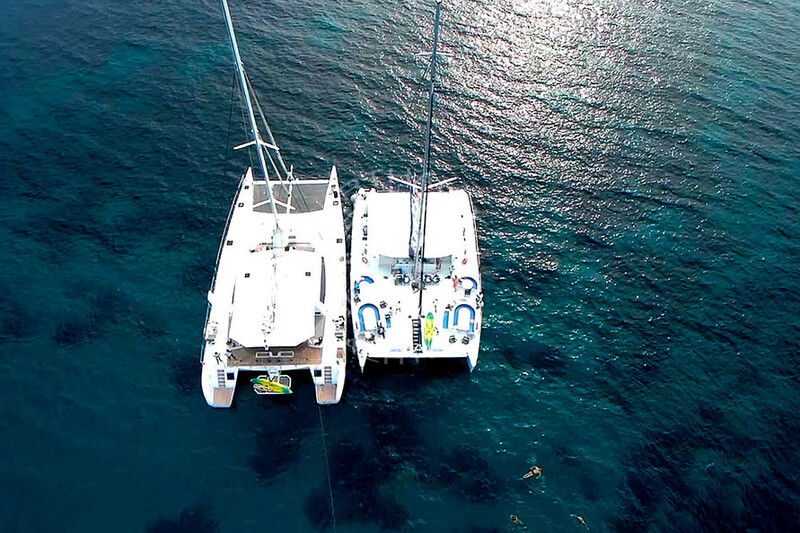 Our maxi catamarans depart from St Tropez and take you on a day cruise, an attractive alternative to the crazy summer traffic for your group travels and an atypical and unique venue for all your projects. Enhance your experience on-board by taking advantage of the various nautical activities available for you: paddle boards, kayaks, snorkelling gear, imagine yourself swimming in the crystal clear waters of the Cap Taillat. Relax yourself on a sunbed, the trampolines are also available and you are sure to witness everyone fighting over them! Our professional crew is at your service and even propose optional catering options. Our maxi catamarans in St Tropez are an attractive venue in a privileged setting with various advantages: flexibility, mobility, originality…. 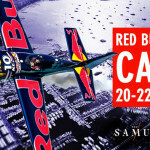 An experience that remains trendy whilst in a relaxing atmosphere accessible by all. 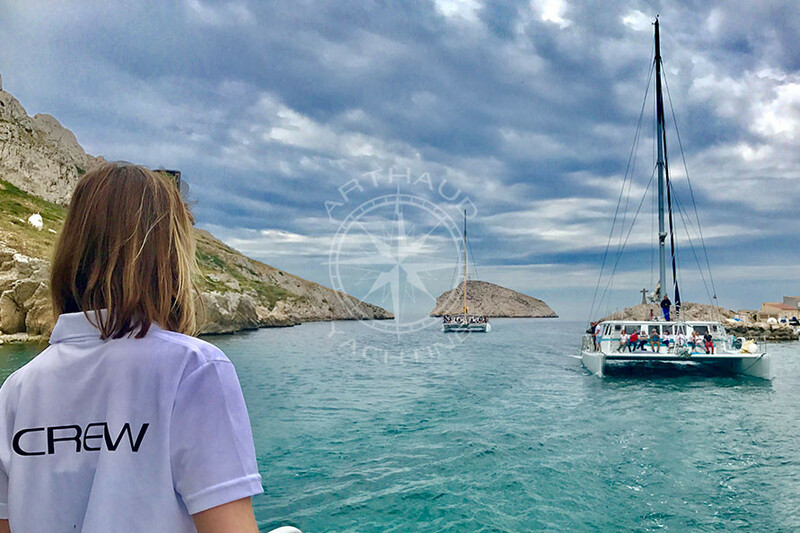 Imagine your next marketing operation…Arthaud Yachting welcomes you on-board! We’ll get back to you shortly after.